The fifth edition of the Morbihan Paddle Trophy Ouest France will take place on June 2018, 23th and 24th, in the « Golfe du Morbihan », Brittany. More than 500 athletes are expected. The first four events were extremely successful, with 200 athletes taking part in the first edition, 280 in the second, 396 in the third and 505 in the fourth. tip of Toulvern in the cove of Baden. Once the paddlers reach Fort Espagnol (Crac’h), the departure of the « Jeunes » category (under 15) will be given (11 :30 am), thus giving us all a splendid finish that should take place around noon for the earliest. Fees include the participation in the selected races, transport by bus, goodies from our sponsors, not to mention everything connected with the overall organization. The fifth annual event getting ready ! 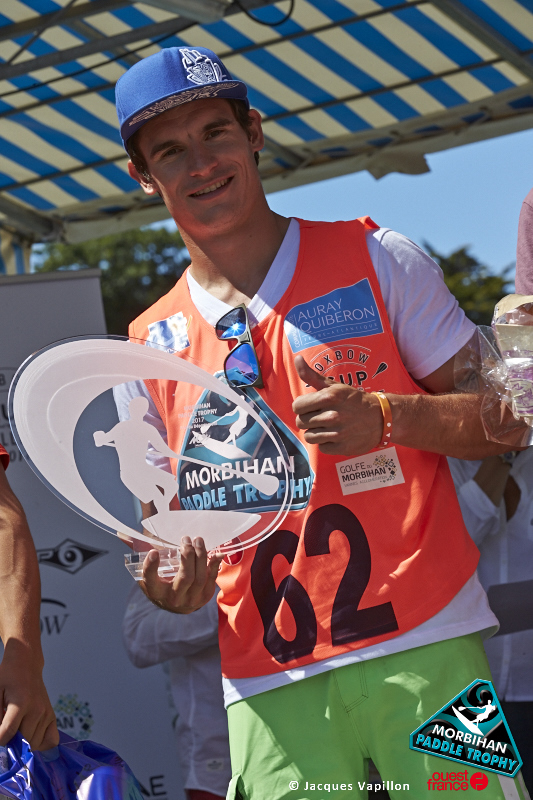 The 4th annual Morbihan Paddle Trophy Ouest-France event saw an incredible 25% increase in the number of competitors ! The new courses were enjoyed not only by the Elite category but also by the Raiders and those who took part in « the Great Walk on Water ». With such a success, a fifth event is sure to take place to have the best SUP lovers from all over Europe meet and compete in the magnificient Golfe du Morbihan in Brittany (France). 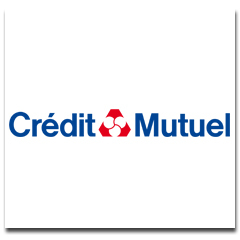 According to the tide charts, the best week-end to organize the fifth Morbihan Paddle Trophy Ouest-France will be on June 23rd and 24th, with a high tide at St Goustan-Auray at 3:10 pm and 3:56 pm. On this specific week-end, both the time and level of the tide will allow us to launch the « Big Course » for the MPTOF’s fifth anniversary. It will join Vannes to Auray covering 28km for the Elite category who will benefit from the ebb tide for an hour and a half from Vannes to get to the junction of the Auray river and then enjoy the ride to Auray with the flow. To be sure, alternative options will be on the ready to face changes due to weather conditions if necessary. We are also thinking about setting up a great Breton dinner for all competitors at Saint-Goustan on Saturday night. We aim at making the MPTOF one of the best SUP event to give our utmost to competitors, sponsors – public and private, Brittany, the Morbihan département and the extraordinary area the Quiberon-Golfe du Morbihan is for the practice of stand-up paddle boarding. With nearly 500 competitors of all levels taking part in the 4th annual event, the MPTOF has undoubtedly become one of the key SUP event in France. 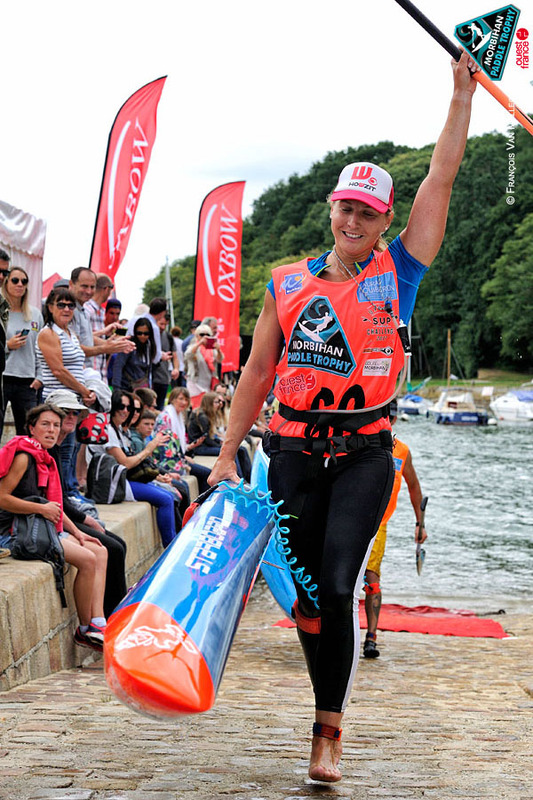 Both Boris Jinvresse and Amandine Chazot, the great winners of the fourth edition of the Morbihan Paddle Trophy Ouest-France, were really enthusiastic. Not only did they win all the long distance races and the sprints in the harbour of Saint Goustan (Auray) but they also did it with all the enjoyment a great course can bring, even under strain. They loved all the subtleties of riding between the islets and playing with the wind and the currents. The « Raiders » were more numerous with 244 competitors registered, and had a wide range of levels. However, the wind direction did not put off the less prepared and the last ones who fought their way up the river for about 3 hours and a half must not be denied their courage and determination. It took Alexandre Gault, the winner of this category, 1 hour and 32 minutes to finish the 14-km race while the young rising star from Morbihan, Matisse Cloarec aged 15 completed it in 1 hour 34. The competitors came from all over France but also from Belgium, Ireland and Switzerland. They all loved the Golfe du Morbihan, the arrival in the historical harbour of Saint Goustan (Auray), the beautiful departures from different areas that dot the Golfe : Port Navalo, Locmariaquer, Crac’h and Le Bono. Beginners took part in a «Great Walk on Water » and they were delighted to see the Elite from the French cup pass by as they were heading to Saint Goustan. The Walkers’ clapping joined the music played by the Bono brass band who was opening the «Walk » on traditional yachts. The success of this fourth edition of the Morbihan Paddle Trophy Ouest-France together with the steady rise in the number of competitors show how this phenomenon is on the increase and lasting in France. The Golfe du Morbihan proves it is one of the hottest spot to practice Standing Up Paddling. The steady increase in registrations since the 1st edition of the Morbihan Paddle Trophy Ouest-France shows that the practice of stand up paddling is not just the latest fad. 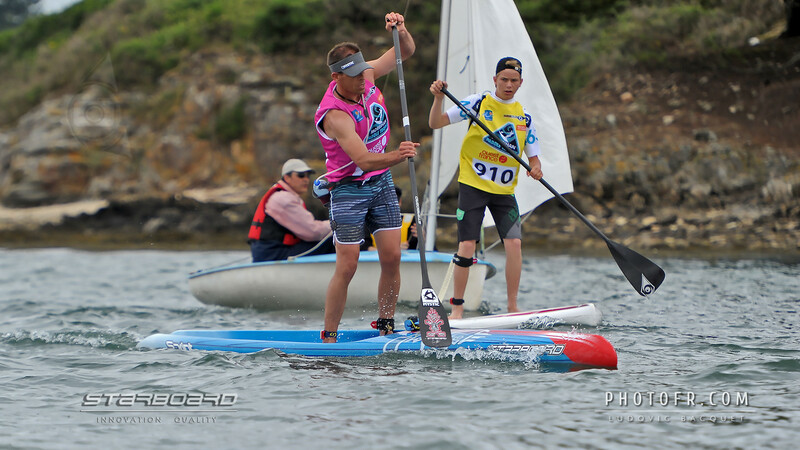 The 4th annual of the Morbihan Paddle Trophy Ouest-France scheduled for July 1st and 2nd in the « Golfe du Morbihan » (southern Brittany – France) shows that stand up paddling keeps on developing. About 500 SUP riders have registered to take part in various competitions ranging from races which require high technical skills to a ride open to all, even to beginners. The « Great Walk on Water », a 5-kilometer ride which will leave from the beautiful small harbour of Le Bono has attracted so many SUP lovers that the organization has had to close entries. This leisure ride also attracts ladies more than the competitions, only 17 ladies out of 99 competitors will take part in the Elite race. The Morbihan Paddle Trophy Ouest-France is not only the second SUP event in France after « SUP en Seine » in Paris but it also definitely comes first as far as public is concerned. Spectators come in large numbers to see the arrivals of the long distance races and the spectacular sprints organized in the event « village ». 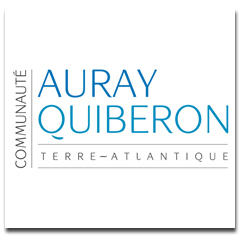 This year, it will be set up at Saint-Goustan harbour in Auray, a lovely historical town. Athletes will try to break records riding 200-metre sprints and 600-metre runs in groups of five and previous winners will show technical tricks in the harbour within easy access to all. The best French SUP riders and a few foreigners will take up the challenge in a long distance race (25km) for the « Coupe de France » on 14’ SUP but also on 12’6 SUP for the well-known Oxbow SUP Challenge in one of the world’s most beautiful areas. As for the « Raiders », 270 competitors (63 ladies and 177 men) will ride a 14-km race from the long sandy beach in Locmariaquer, just outside the gulf and it will be ladies first, followed by men. Finally, under-15s will have the opportunity to compete with the best riders as the departure of their 7-km race will be given as the « Elites » ride by, from Fort Espagnol on the Auray river. The fourth edition of the Morbihan Paddle Trophy Ouest France will take place on July 1st and 2nd 2017, in the « Golfe du Morbihan », Brittany, and 500 athletes are expected. The first three events were extremely successful, with 200 athletes taking part in the first edition, 280 in the second and 396 in the third. 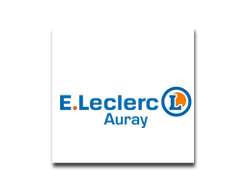 On Sunday 2nd, at 11am, the « Elite » category will leave Le Crouesty harbour, paddle up the Auray river while at 11.30, the 300 contestants in the « Raider » category who will leave from Locmariaquer, will follow suit. Once the paddlers reach Fort Espagnol (Crac’h), the departure of the « Jeunes » category (under 15) will be given, thus giving us all a splendid finish that should take place around 1.30 pm for the earliest. 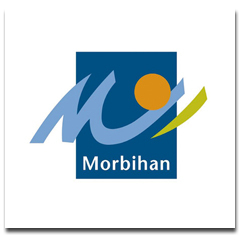 The second staging of the Morbihan Paddle Trophy Ouest-France event will be held on June 13th and 14th, 2015, in the Gulf of Morbihan. The first staging, which took place at the end of August 2014, was successful on a surprising scale as much in terms of the number of participants as the number of spectators and by the atmosphere, which reigned during two days in Vannes and the Gulf. At the Paris boat show, the organizer, Gérard FUSIL, on the Morbihan General Council stand which supports the event, presented the 2015 event and underlined the ambitions which inspire it. He was surrounded by the partners that he has had from the very beginning: Jean-Paul BOUCHER, Managing Director of Ouest-France and Philippe MIRKOVIC, director of Ouest-France Morbihan as well as Thierry Verneuil, CEO of BIC Sport. - Did you expect the first staging of the event to be such a success? Gérard Fusil – I hoped for it! The sport is rather new in France but I knew that there was huge potential for such a gathering. Firstly, it appeals to a wide range of people: men, women, children, young people, less young, real sportsmen or leisure sportsmen, even non-sportsmen, are capable of standing on a board and of having fun very quickly, exactly like on a bicycle. Further, it is easy to get started with this sport. A board can be transported easily, especially the inflatable type, and a simple and cheap model already allows a lot of people to have fun. Getting into the water is child’s play; the basic equipment, swimsuit and paddle are affordable! Added to these aspects was something that I did not expect: the pleasure of navigating together. Stand-up Paddle is a very sociable sport. Although the practice is individual, we have fun together, we speak and we meet up. The contact is easy and immediate, American-style. Therefore, many beginners dared to launch among the 123 competitors who left from Baden on the 12 km Raiders course. As there was only one person who abandoned the race, I think that in 2015 all the practitioners, even the most novice, will have the courage to join us. Among the 77 competitors who did the 24 km Port-Navalo Vannes course, there were some of the best French competitors. We will have, in principle, all the best French competitors in 2015 and some big foreign champions too. - You modified the dates of the event. G.F. – The dates will necessarily change every year. We are dependent on the tides to enter the port of Vannes with the flow. Good weekends are not legion and, furthermore, it is important not to have a clash between events in Vannes and events in the Gulf of Morbihan, which are numerous. We chose a weekend in June, which was free at the time we made this decision, two months ago. I must add that our two objectives are to promote the Gulf of Morbihan and Stand-up Paddle. The return is better if we are placed at the beginning of the season rather than at the end of the season. - And you have added a race within a race. G.F. – There is a huge demand from young people to do Stand-up Paddle. So we want them to have the opportunity to enjoy the sport too. Everybody runs together, the Elite with the greenhorns. The under 15 year olds can mingle with the champions. Like last year the « Elite » will leave Port-Navalo, but from the Grande Plage, in the face of the wave, in order to enter the Gulf of Morbihan with the current. The raiders will launch when the « Elite » turn around a buoy close to their starting line at Baden-Toulindac. The same goes for the young people who will leave Arradon in the wake of the champions and can finish the course with them. - The weather is one of your partners? G.F. – We are having difficulty agreeing on the contract! It is true that the weather plays an important role. 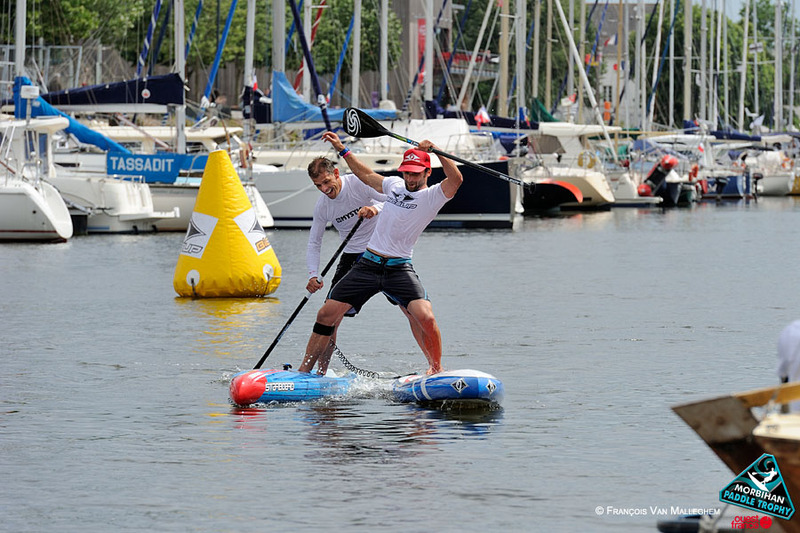 But this celebration of Stand-up Paddle lasts two days, with a Saturday of « runs » and other events in Vannes. We have therefore worked, with our very experienced Race Director, Patrice REMOIVILLE, on plans B, C and D. We have tried to plan everything so that the race remains « fun », with winds and carrying currents in case of weather surprises. It means that we must be capable of adapting our logistics to course modifications made necessary by variable winds. As the 48-hour weather report is as a rule very reliable, we should be able to react in time and warn the competitors by Ouest-France at first and by radio but also by e-mail, Facebook and Twitter. They will all have to be « followers ». It is not obvious in terms of organization because, for the second staging of the event, we will have a big village on the esplanade of the port of Vannes, festivities in the evening, and arrivals on the slipways in the port in the middle of the public. I would clearly prefer good weather, beautiful seas, and sun for 22 hours, as it will be the longest day of the year. - You are asking for a lot! G.F. – I fully believe in Stand-up Paddle. It is not a fashion. It is a sport, that accompanies a new way of living, a little bit like mountain biking, which appeared at the beginning of the 90s. These sports satisfy a need for nature, for togetherness, for gentle and simple movement, for discovery, for easy entry to places close to us but which remain foreign. It turns out that the Gulf of Morbihan is ideal for SUP. We are there at sea, but protected. It is beautiful, expansive and accessible. The coast, small cities, islands and currents make a wonderful world. With these ingredients and the best possible organization, this incomparable annual sporting event has to be a success. 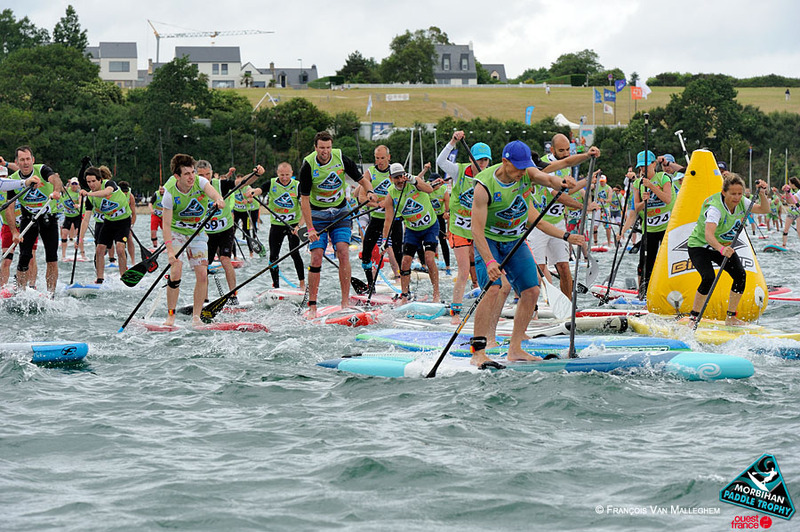 200 competitors participated to the 1st Morbihan Paddle Trophy Ouest France last august 2014 : 77 « elite », 25 kms from the Morbihan golfe entrance to Vannes ; and 123 « raiders », kms 12. Some were just beginners. Everybody but one finished. 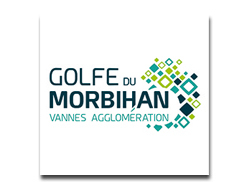 The « Golfe du Morbihan » is an inside sea. The scenary was incredible. Thousands enthousiastic spectators cheered the paddlers. 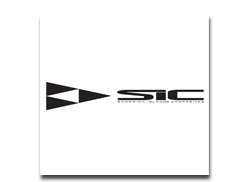 Edition 2 will occur 2015 june 13-14 . Organizers are waiting for 300 or 400 competitors. 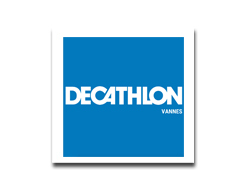 The « Elite » competitors will leave a beach ocean side, and enter the Morbihan Golfe as like into a superb natural stadium, with the stream and, hopefully, the wind. The raiders will be launched one hour later, for kms 12, when the Elites are passing-by. New category, the under fifteen, will be launched form Arradon for a 7 kms distance to Vannes. Everbody is on the same course but with an appropriate distance depending of the practise level. That is the key of the great atmosphere. Normally, Saturday 13th is a day for runs and SUP feast in Vannes harbour which is in the heart of the city . Sunday 14 is the day for the long distance race. However, the organisers are ready to modify the program if necessary, weather depending, as they want to set on the best course for the competitors to enjoy. A lot of fun and a lot of prizes!